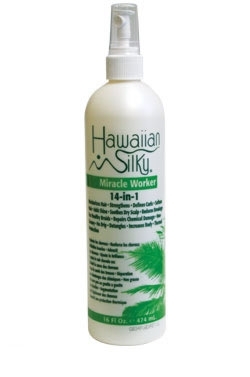 HAWAIIAN SILKY MIRACLE WORKER 14-in-1 is the a unique Hair Care solution that treats all hair this its all natural healing properties. While maintaining your current hairstyle and adding a natural softness and look to your hair. THIS HAIRCARE TREATMENT is great for any hair type male or female. 14-in-1 also works as a natural leave-in-conditioner while rejuvenating your hair for added softness and strength. Hold bottle about 12inches away from hair and spray evenly. Massage into hair and scalp and style. For curly hair and braids use daily. On relaxed or straight hair use prior to drying.